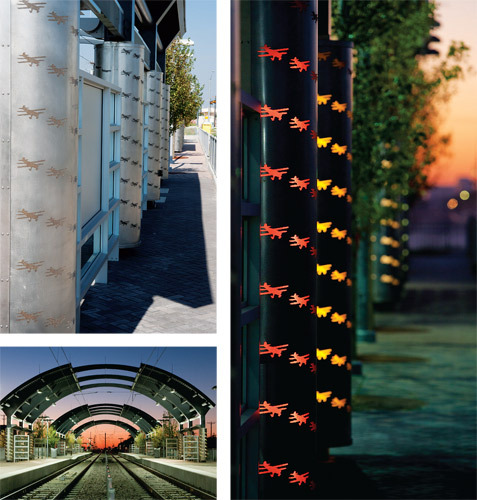 Artist Susan Magilow's design for this station celebrates the influence that nearby Dallas Love Field Airport had on the area. The platform features stainless steel columns with miniature planes laser punched into them. The punches depict the evolution of aircraft from past to present. Each of the columns is lined with a different colored acrylic liner to symbolize the area's diversity. The columns also have been backlit with LED lights for a breathtaking nighttime view. The windscreens use historical photographs in an uncommon way, applying them in a woven pattern underlay. The artist chose a woven pattern to refer to the character of the neighborhood. It implies that the neighborhood businesses and Dallas Love Field Airport have worked together and existed side by side since 1929, when Delta Air Service operated the first passenger flight from Dallas. The colors used on each windscreen match the color of the neighboring column. The platform is done in a herringbone pattern of charcoal, pewter and light brown pavers, again in reference to the close-knit character of the community. The pavers gradually move from lightest to darkest along the platform. This project gives riders an entry point to the best in ground transportation - DART Rail - and a nod to one of the metroplex's most significant options by air, Dallas Love Field Airport.